Simplicity is a big trend in the Internet security industry alongside with mobile and cloud-based computing and it looks like Bullguard has proven to be the top player in the game when it comes to this. The software provides all the features that you will probably need at some point, while at the same time keeping the interface easy to use. The pricing is also very good compared to its counterparts that are on the same level. This Bullguard Internet Security review will try to help you choose if this software is worth the $80 you need to spend for it. Bullguard Internet Security possesses every feature that the average individual that browses the Internet probably needs. You will find regular elements like antivirus protection and firewall to some pretty cool options like identity theft protection or even instant messaging protection. 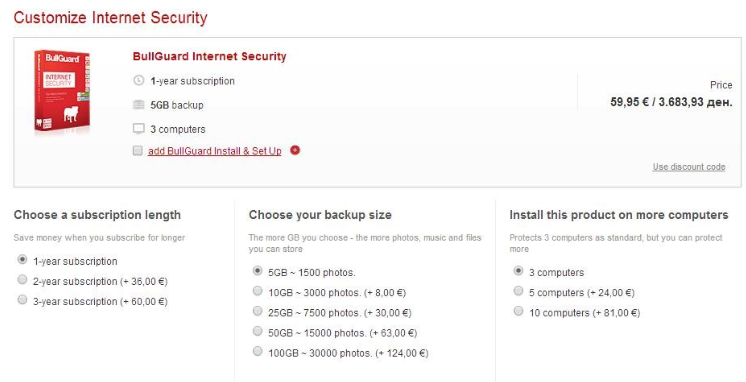 Here are some of the key and most important features that are a part of the Bullguard Internet Security pack. 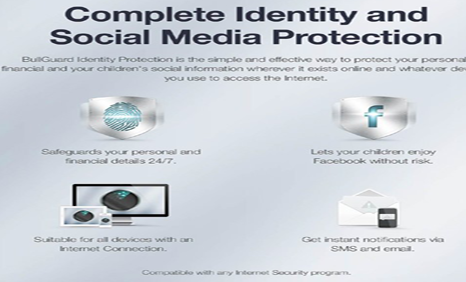 The Identity Theft Protection features will monitor those parts of the web that you visit where you share sensitive data like personal or bank information. Smaller part of this option is the Social Media Protection that will monitor all of your activities on all available social media platforms and make sure that you don’t receive messages containing malware or visit pages that can harm your computer. This also considered being a good tool to be added to the regular use of parental control. You can set a predetermined list of types of information that you want to be monitored, so Bullguard Internet Security will send you an email or SMS whenever this info is being compromised by a third party. Before installing anything on your computer Bullguard will check your device in order to find any possible malware or viruses. After it has cleaned your computer from all harmful viruses it will check for the latest updates and start running in the background. Easy as one-two-three you’ll be done in less than five minutes. IM Protection will keep everything you send through personal messages visible only between you and the people you contact. This will significantly decrease the amount of knowledge that corporations have about you through the usage of social media crawling. Ever wondered how AdSense and Facebook know what exactly what commercials to place on the pages you visit? They monitor all of your instant messaging activities and compile a customer persona based on that. We already mentioned that Bullguard tried to make its Internet Security software as simple as possible, so the end user wouldn’t need to spend too much time on personalization. That’s why the company has added the one-click scan feature or button as someone would prefer. You just need to enter one of the modules available in the home panel and click on the action button. You can scan your computer for malware, make a backup of your files or even do an anti-spam filtering by a single click on the mouse. Pricing is something that we previously mentioned, but here we will present all the pricing plans that Bullguard offers. The basic plan includes one year subscription, licenses for three devices and 5GB of storage space. This package is worth $80 and can rise up to $120 if you want the team at Bullguard to install the software on your PC. You can pay additional $30 for two more licenses and $100 if you want to use Bullguard on ten different devices. You can also choose multiple years of subscription up till 3 years, which will cost you $80. It is also possible the upgrade the storage space up to 100GB with the price tag of $160. The Bullguard Internet Security software is extremely easy to use and you will be feeling like everything is on autopilot while the program runs in the background. It is true that this comes with a certain price when you see that some of the features are made so simple that they lack in quality in certain aspects. For example your kids will quickly figure out how to turn off the parenting control feature while they browse the internet. You’ll get 5GB of free online storage with the basic pricing plan, which can be updated up to 100GB if you choose to pay more for this feature. You will be able to store important personal and banking information out here, as well as various media files like videos, pictures, presentations, music and many more. You can choose between auto-backup or just click on the backup icon whenever you think that’s necessary. Great number of websites are created to perform phishing activities and there is a high probability that you’ll not even notice that this is happening. That’s why Bullguard Internet Security will check all of the websites that come up in your search results and inform you about some possible dangers connected with each one of them. Not only that this security software doesn’t impact the performance of your computer, but it also improves it at the same time. Your Bullguard Internet Security software will take care of all the necessary files that you have stored on your hard disk and get rid of them while you don’t need to move a single muscle. Aced almost every test connected with Internet Security. The spam filter is very accurate. Firewall will also keep you safe from various types of malware. Identifies security problems in real time. Small impact on the overall performance of your device. Accurate, but slow spam filter. Too much decision making required from the user in the firewall. Firewall often blocks Internet Explorer. Parental control can be disabled in no time. Judgment time has come for this Bullguard edition. We still think that everybody that uses the Bullguard Internet Security pack will harness all of the positive sides from all the features it offers. It is very user friendly, not pricey at all and offers some really cool features. Although some of the features are not top-notch the company is giving more in terms of the overall performance of your device and the quality of your Internet user experience. We can’t wait to hear your opinion about Bullguard Internet Security and any experiences that you may have with it. Bullguard is one of the most user friendly security software systems that you will find. Its core postulates of the way the software is designed place safety, ease of use and safety on the top spot. That’s one of the main reasons why more than 13 million users worldwide thrust the Bullguard Internet Security product and use it as their sole companion during their online travel in the ever evolving world of the Internet.